Below is a detailed map of South West of Ireland, indicating Shannon, Cork and Kerry Airports. To calculate driving distances and routing we recommend the Ireland AA Roadwatch Route Planning website. Kerry Ocean Lodge is easy to find - we are located on the left hand side at the entrance to Glenbeigh village on the N70 route from Killorglin. 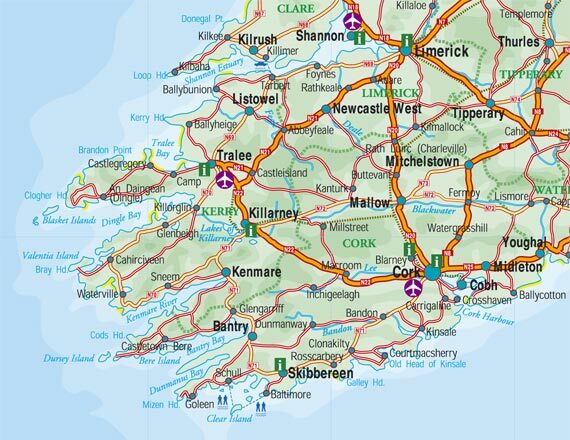 To order hard copy maps of Ireland check out the Ordnance Survey Ireland site. The Ring of Kerry route traditionally starts and ends in Killarney, along the N70, taking in Killorglin, Glenbeigh, Cahirciveen, Waterville, Sneem and time permitting, Kenmare. The road is narrow in places and it is always recommended to travel anti-clockwise in the above order! Magnificent scenery and well worth the drive! !